Kerhonkson, NY - An Ulster County summer camp has been ordered closed by local officials amid complaints from neighbors about an unbearable sewage smell that was indicative of a larger issue that posed a health risk to campers and local residents. The Daily Freeman reported that Camp Rav Tov in Kerhonkson was shut down by the Ulster County Health Department on Thursday, with all operations at the camp terminated by 5 PM on Monday. Approximately 1,000 girls attend the Cherrywood Road camp, one of four Rav Tov Satmar summer camps in Ulster County. Ulster County Health Commissioner Dr. Carol Smith said that the camp’s septic system was malfunctioning, causing raw sewage to overflow onto the ground. “Reports from the town are that it kind of trickled down into the roadway,” said Smith, who noted that the camp’s aging septic system was probably not capable of accommodating the large number of campers at the facility. Smith said that she had been in touch with the camp on several occasions about the issue, but that steps taken to remedy the problem were inadequate. 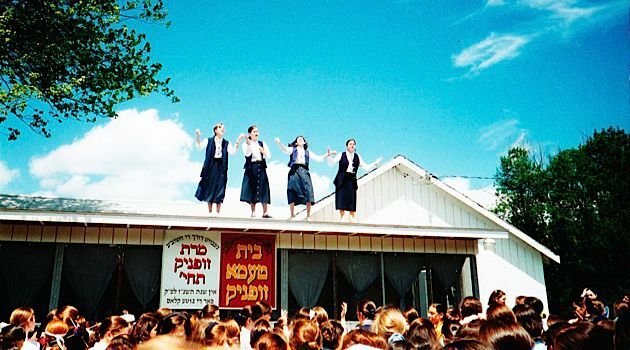 According to News 12, the sewage problem began at Camp Rav Tov several years ago when the camp installed solar panels atop their leach field, an integral part of the facility’s septic system. Problems that were identified with the camp’s private sewer system last year have yet to be corrected, with officials blaming inadequate maintenance for the foul smell. “It takes your breath away sometimes its so bad,” said one neighbor. Neighbor Tom Felter told the Shawangunk Journal that his property’s well had been tainted by the camp’s sewage. A test on Felter’s water supply came back with “not satisfactory” results and Felter said he would need to shock his own water system with chlorine to fix the problem. Multiple pump and panel trucks have made their way to the camp over the past week, said Felter, who noted that he has yet to see any signs of anyone vacating the camp. “We’ll see what happens by Monday,” said Felter. Neighbors have also complained about excessive noise from the camp’s loudspeakers at all hours of the day and night, buses and trucks blocking area roadways, campers marching loudly on local roads and excessive litter. Officials from Camp Rav Tov were not immediately available to comment on the matter. Hatzna leches im elokechu - lifnim meshuras hadin applies to interpersonal interactions as well, particularly because of loved shemayim. While I am certain that the truth is nowhere as one sided as this article suggests, this is something that can and should have been avoided or remedied. Sounds like a terrible situation for everyone in the vicinity. If it’s indeed as reported in this article, no time should be wasted (pun unintended) in effectively fixing the problem and campers should’ve immediately been sent packing. Seriously, only in connection with the Chassidishe velt do we hear such stories. Why! Big Chillul Hashem, but no-one there cares because Goyim are there to be used in most Harrison's eyes. Why is it that the haredi community is clueless about zoning and overburdening systems ? This includes shul, yeshiva and home expansions ,too . It’s as if no one else exists , and they don’t respect civil laws. Move the camp to Israel ,the Medina will take good care . They probably wanted to save money for another year and it did not work. Now they will have fines and penalties on top of everything!! Why is it that you hate the haredi community so much ??? Any time there is any negative story on haredim, you always paint all hareidim with a big evil brush. 2) Do you really believe that in today's day and age , 2018, the campers & staff + all visiting parents would tolerate such foul sewage odors ?? Only in your world, yonasonw, your frum-hating, trump-hating world, snowflake! For a sec forget the neighbors. Forget the money needed to fix the system. Forget the shanda. Think of the 1000 GIRLS IN THE CAMP! Their health and safety is jeopardized by the 'machers' running the camp! You'd think they'd care about their own kids, their own community. BUT THEY DON'T. Same w every charedi zoning, health & safety issue in the Catskills. I know. I live here all year. Its why folks HATE frum people and Jews like me. I have to try to explain the behavior. AND I CAN'T!. It's conveniently shut down after rosh chodesh elul when the new zman for yeshivas start. My bro Munch says that it's because this is primarily a Chassidic website, and therefore it reports news about the Chassidic world that would not be considered newsworthy had they occurred outside the community. sorry Judith for your anti chareidi comment: there are hundreds of hareidi camps including camp rav tov who adhere to all local laws and health codes. You are Not familiar with the facts and your sinah you show to chareidim sticks out in your writing.